Parmigiani Fleurier has manufactured a magnificent 15-Day Solid Silver Table Clock that brings home the silver – not the Olympic silver, but solid silver charisma that is both stunning and elegant. Parmigiani Fleurier has captured the traditional spirit of table clocks and fused it with the innovative mastery of technology to create a stunning union of timeless beauty. This beautiful 15-Day Solid Silver Table Clock represents as the Parmigiani Fleurier brand touts it, an accumulation of 192 years of inherent horology design and mastery – hear, hear. 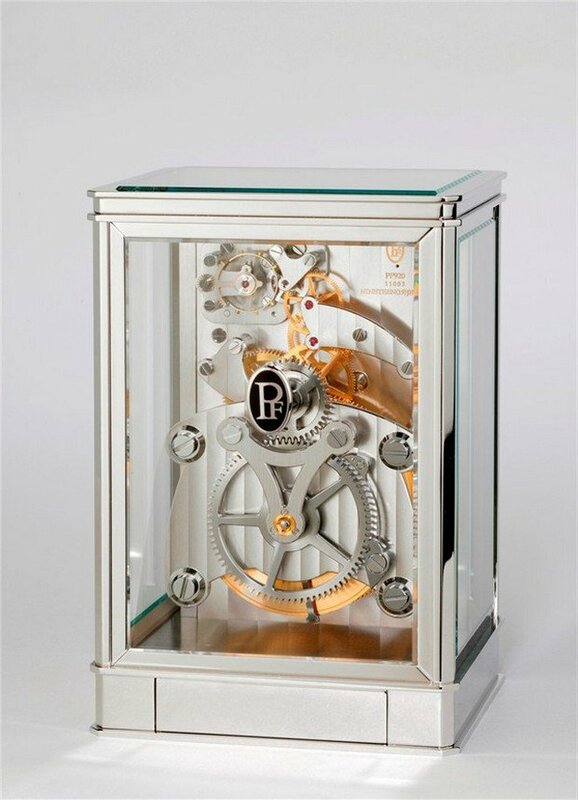 As table clocks go the 15 Day Solid Silver Table Clock has raised the horology bar not only with its refined shapes and aesthetic appeal, its Parmigiani patented pending operational technology leaves much to aspire for other up and coming table clocks. This stunning 15-Day Solid Silver Table Clock is meticulously crafted inside a one kilogram case of solid silver which is plated with rhodium to prevent oxidation. This stunning beauty has a height of 142 mm, a width of 96 mm and a depth of 80 mm. 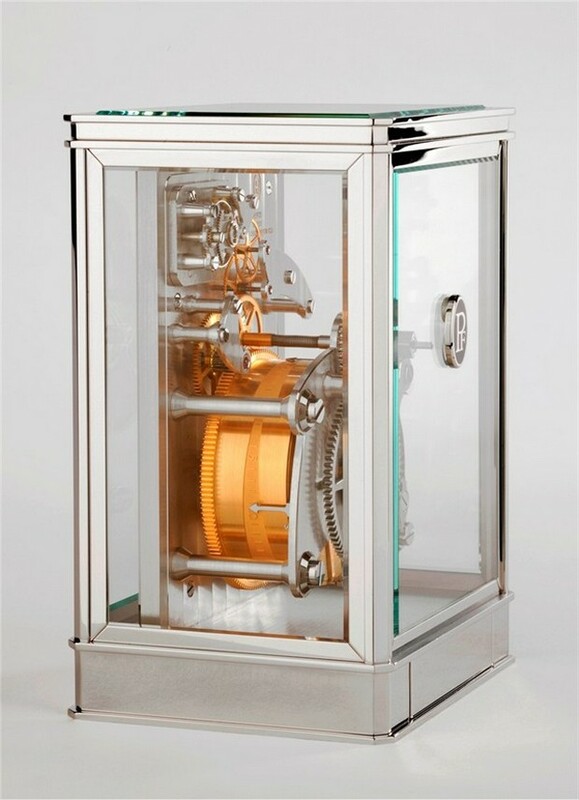 It is surrounded by faceted mineral glass crystal that provides an unobstructed rear view of the elaborate workings of the clock. 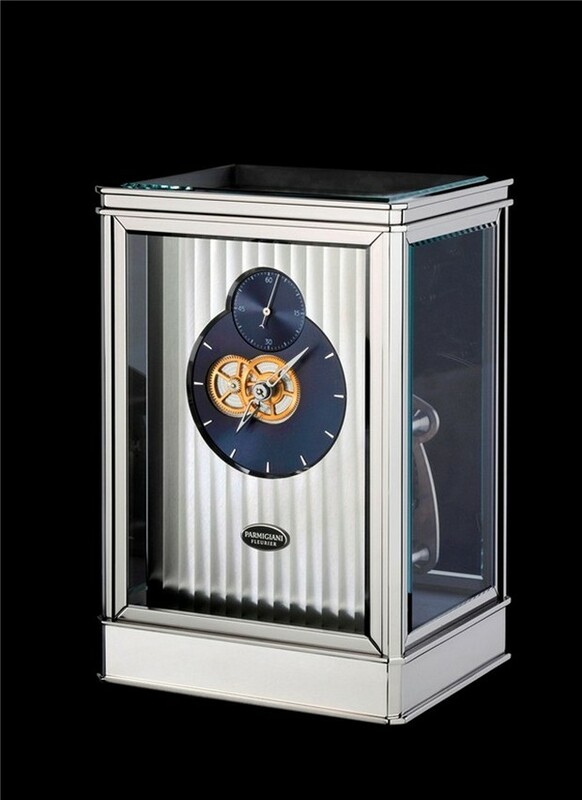 The 15-Day Solid Silver Table Clock show cases two sunray lacquered blue dials that present time in an opulent manner. The smaller dial is positioned at 12 o’clock just above its large counter dial. The small dial displays seconds while the larger dial presents hours and minutes shimmering against its blue background. As the 15-Day name implies it refers to the table clock’s 15 day power reserve feature which is Parmigiani Fleurier’s patented innovation. This Maltese cross inspired mechanism allows the 15 day power reserve to be featured on the side of the barrel. This exclusive winding power reserve system, in the patenting process, is made of an axis linked to a cam, which allows four hands to jump in counter movement to it – quite an impressive feature. It is powered by Parmigiani Fleurier calibre PF 920m – an ingenious system through which the escapement is provided with a force of constant intensity. A high density wheel, driven by a main spring, is mounted on the pinion of the escapement axis, with the escapement wheel being free. Parmigiani Fleurier has employed a spiral to link these two components, which thanks to the wheel’s inertia – can now drive the escapement wheel in a more consistent manner. The clock is wound by two separate keys that operate through one opening. The keys are well hidden in a small discreet compartment drawer at the rear base of the table clock. One key winds the clock while the other adjusts its time. In essence this table clock has, as Michel Parmigiani touts it, over 192 year of horology experience to its credit. Parmigiani originally launched his company under the name Parmigiani Mesure et Arts du Temp in 1975. His company gained notoriety restoring antique clocks, most of which were deemed beyond repair. One restoration that established the brands’ notoriety was that of the 1820 Breguet Sympathique. The company later evolved to the brand name Parmigiani Fleurier in 1996, the rest is a tale of timeless history.